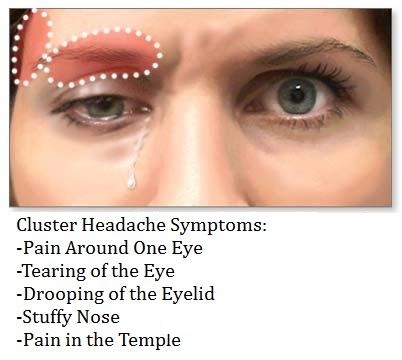 Cluster headache is a severe recurring pain on one side of the head, usually around the eye and along the temple. The pain is experienced in clusters; thus the name cluster headache was coined. Patients often describe the pain as comparable to being drilled. Cluster headache can even be more severe and debilitating than migraine. It can last for 3 hours and can persist up to eight times daily. The cycles may last for a day or up to several weeks. Adults and males are more prone to cluster headache; however, this neurological disorder can also be experienced by children. 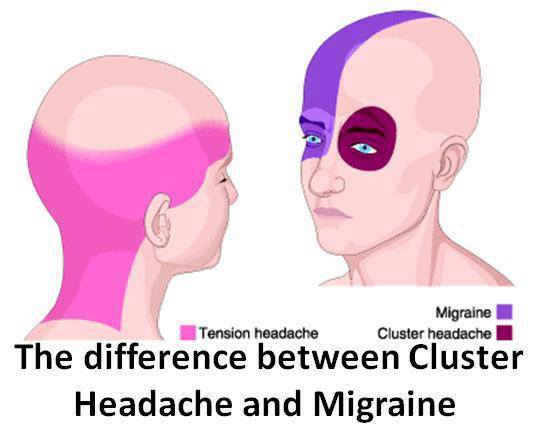 As said earlier, cluster headache is one-sided. Pain may also be experienced along the forehead and across the cheek of the side that is affected. In some cases, pain is also felt in the ears, neck, and shoulder. Sufferers likewise experience watering of the eye, swelling of the eyelid, and a runny nose. Other symptoms of cluster headache are similar to migraine symptoms, such as sensitivity to light, sounds, and smells. At present, the definite cause of cluster headache is still unknown; however some happenings may be linked to this type of headache. Studies reveal that during a cluster headache attack, the ophthalmic artery is dilated. Some abnormalities in the cavernous sinus are also reported to be responsible for this head pain. Furthermore, patients say that they experience some irregularities in other parts of their bodies during the attacks. Meanwhile, the following are believed to trigger cluster headaches: stress, environmental changes, smoking, alcohol, histamines, and nitroglycerin. There are two types of cluster headache, namely episodic and chronic. In episodic cluster headache, attacks recur after one or more months, whereas in chronic cluster headache, headaches can occur several times everyday. Cluster headache is often misdiagnosed as migraine and vice versa. These two types of headache indeed have some similar symptoms, but they are actually very different. Some symptoms are alike, such as sensitivity to light, sound, and smell. Both migraine and cluster headache are severe, recurrent, and debilitating. Cluster headache is always one-sided; unilateral pain can also occur during migraine attacks. Migraine is commonly experienced by women, while cluster headache is more common in men. Migraine sufferers have the urge to lie down and rest. Cluster headache sufferers feel restless during an attack. Migraine is characterized by a pounding pain. Cluster headache is described as a burning pain associated to a drilling sensation. During a migraine attack, the pain is usually from moderate to severe. Cluster headaches are always severe. Migraine attacks usually last for several hours or even up to 3 days. Cluster headaches usually last for 15 minutes to 3 hours and can occur several times everyday. Symptoms of migraine usually come slowly, but may also come suddenly. Symptoms of cluster headache usually come rapidly. Migraine headache usually decrease gradually, while cluster headache usually decrease suddenly. Do you experience cluster headaches? If yes, please bear in mind that it is better to have different treatment options for your condition. Since cluster headache is a recurring neurological disorder, its treatment is divided into two categories: relief and prevention. In persistent conditions like this, it is indeed important to observe pain relief measures along with some preventive methods. Medicines prescribed by doctors may be effective in relieving headaches. Different medications for cluster headache are injectable sumatriptan, dihydroergotamine, and nasal sprays. However, due to the severity of the pain, some cases do not respond to medications. For this, it would be better to consult the doctor. Experts believe that aside from relieving pain, massage therapy can also release headache-causing chemicals in the brain. Furthermore, massage can also prevent headaches by blocking pain signals. Both hot and cold therapy can reduce inflammation that causes headaches. Hot or cold therapy is comprised of different simple practices such as having a cold or hot shower, applying a cold or hot compress, and walking in cold air. Such practices are reported to be effective in easing head pains. Some medications can decrease the recurrence of cluster headache attacks. Some of these are steroids, verapamil, lithium, valproic acid, topiramate, and melatonin. As mentioned earlier, stress can trigger headaches. You can get it from strenuous activities or from intense emotional situations. Hence, you should always make it a point to relax and avoid different stressors that may be caused by your daily activities. Some foods containing MSG and sodium nitrite may trigger headache attacks. Thus, you should avoid eating foods containing these substances. Furthermore, it is also important for you to eat regularly, for changes in eating patterns are also believed to trigger head pains. Exercise can relax the body and release its natural painkillers called endorphins. Hence, getting regular exercise can help prevent or lessen the occurrence of headaches. You may try simple exercises like walking, jogging, and simple stretching. The pieces of information discussed above are just some of the basic things you need to know about cluster headache. From here, you can opt to dig deeper and find more detailed information about this recurring neurological disorder. Should you suffer from a severe chronic headache, don’t hesitate to talk to your doctor. Tell him everything that you feel. Give him all the specific details about your pain, for this can help you avoid being misdiagnosed. It is important to always follow the advice of your physician. More than that, you should also practice a better lifestyle. You may not know it, but your mere lifestyle choice can be the main cause of all the body discomforts that you experience. This post was guest-authored by Jim Gilbertson, a health and fitness enthusiast. He is a creator of Headache and Migraine resource which can be found at www.headachecures.org.